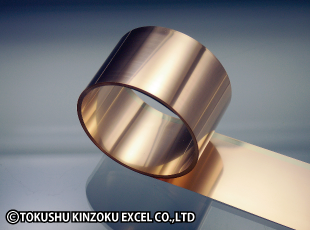 Clad Metals (Materials Composed of Different Metals) | TOKUSHU KINZOKU EXCEL CO.,LTD. *Available ranges will change according to alloys types. Clad metals are materials composed of two or more different types of metal. They are high functionality metal materials that possess composite properties that cannot be obtained from single materials. As clad metals are diffusion bonded (i.e. alloyed via elemental diffusion) at the boundary surfaces between the different metals, there is less chance that they will peel off like plating. Clad metals can help reduce total costs by allowing you to eliminate processes, increase quality, reduce lead time, and make other improvements. • As bonded surfaces are held together by metallic bonding, the bond is the strongest possible (bonded metals will not peel off). • Cladding layers can be made thick (e.g. several 100 μm), allowing the transfer of high currents. 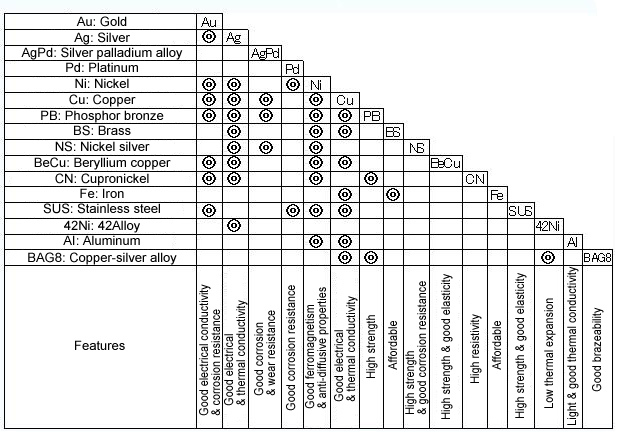 • Multiple alloys can be bonded. • Hardness can be adjusted by rolling and heat treatment. • Striped inlay cladding can be produced. • There are limitations on substrates and overlay metals that can be used for plating , but cladding allows a diverse range of materials. • Both double-layer and multi-layer products available. Clad metals are unique materials that provide a wealth of possibilities! 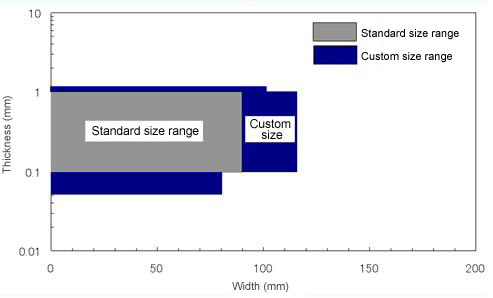 Standard size range is indicated in graph below, but actual size range differs according to material combination. Contact Tokkin for more details. The table below shows cladding materials that we have manufactured. We are also happy to consider combinations that are not shown below. Please contact us for more information. We can manufacture custom-made products to suit your requirements in terms of cladding width, thickness, distance from edge, number of strips, and other features. Prototypes for custom-made products can be made in orders as small as several tens of kilograms in weight. We are also happy to consider even smaller lots upon consultation. We can manufacture materials with more-precise thickness tolerances than general standards-compliant products. High contact pressure. Suited to sliding applications. Affordable six-part alloy. Suited to sliding applications.